Surgery is a precise, delicate procedure, reliant upon a surgeon’s steady hands and skills. Scientists at the University of Houston are developing systems to augment a surgeon’s expertise with detailed imaging and surgical assistance. The cyber-physical system for multimodal image-guided robot-assisted surgeries, called ‘MIROS,’ is aimed at enhancing a doctor’s capabilities. Nikolaos Tsekos, associate professor of computer science in the College of Natural Sciences and Mathematics, is involved in a multidisciplinary and multi-institutional collaboration developing this system. The goal is to one day be able to place a patient inside an MRI machine, where a surgeon can scan the area of interest, and then, using this information, guide robots to perform surgery or deliver drugs at precisions of less than a millimeter. In short, it promises to give a surgeon a high-resolution, three-dimensional image of the targeted area, and, with the aid of robots, the precision to operate at a higher scale. Accomplishing this is its own technical feat. Tsekos, whose expertise is in MRI, robotics and computational methods, has established collaborations with engineers and medical researchers throughout his career. One of the critical challenges Tsekos’ team is investigating is at the core of image-guided surgeries: efficient real-time MRI. Collecting data from an MRI, especially in a situation such as imaging a patient’s beating heart while performing a procedure, requires imaging capabilities that keep up with changing conditions. Achieving this is a matter of speed and sensing selectivity. Tsekos says the team is moving toward an artificial intelligence approach that touches the boundaries of machine learning and physics. Currently, Tsekos’ research group is working on two different types of robots for MRI-guided interventions. These robots must be compatible with the strong magnetic fields generated by MRI machines, meaning all components must be non-magnetic and non-conductive. The first type of robot deals with the extreme magnetic fields of an MRI scanner by residing outside the scanner. These robots direct thin, flexible hoses, filled with solid spheres and bushings, which carry interventional tools, such as biopsy or ablation needles, to specific parts of the body. To date, this research has yielded three patents, with further development and testing underway. This testing is being done by the start-up GuidaBot LLC, which is a collaboration between UH and Fannin Innovation Studio. 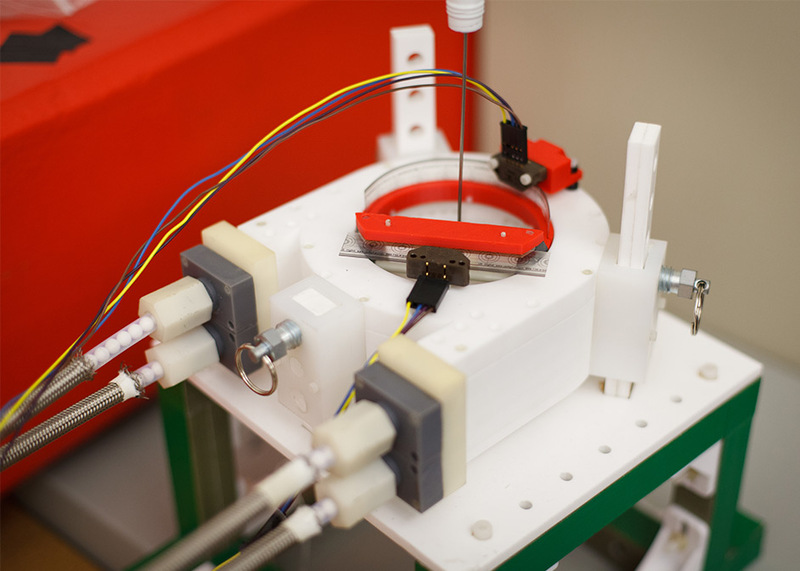 Tsekos’ second robotic system uses the magnetic field of an MRI to move tiny metal spheres inside the blood vessels of body, which can be used to deliver drug treatments to specific areas. “We want to create a system that is simple, intuitive and can be used by physicians everywhere,” Tsekos said. Moving forward, Tsekos’ group is investigating holographic techniques using the smart-glasses HoloLens. In theory, physicians would wear a set of smart glasses that would allow them to “walk” inside a three-dimensional image of the patient’s body while executing a procedure with a robot. 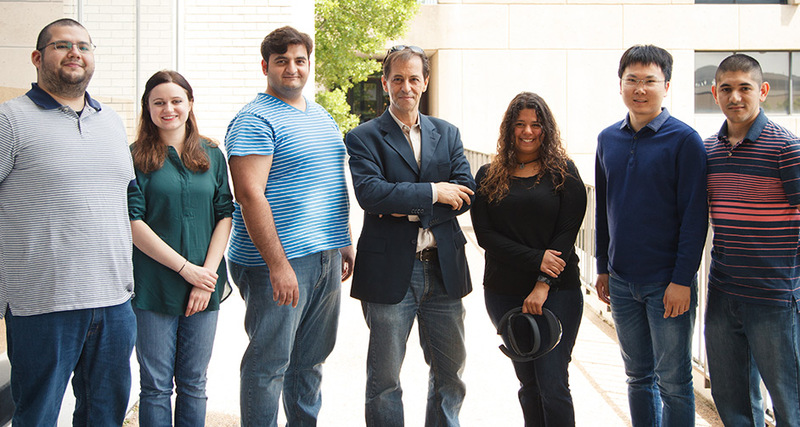 UH collaborators include computer science faculty members Quoning Chen Lennart Johnsson and Ioannis Pavlidis, and engineering faculty members Karolos Grigoriadis and Aaron Becker. University of Texas MD Anderson Cancer Center faculty members Jeffrey Weinberg and R. Jason Stafford. International collaborators also include Andrew Webb at the University of Leiden in Netherlands and Ioannis Seimens at the Demokritus University of Thrace in Greece. This research is funded by the National Science Foundation, the Stavros Niarchos Foundation and the Qatar National Research Fund.